Don’t let a flood or fire compromise the structure of your home. The DRYmedic® Team is Available 24/7! They say “water always wins,” but we disagree. 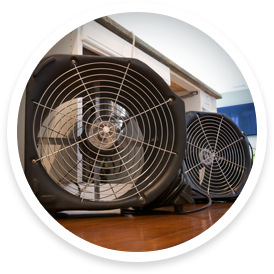 Our water damage restoration services stop mold and water damage in its tracks. Just like water, fire and smoke can spread fast. Our fire and smoke damage experts will help get your life back to normal ASAP. Natural disasters, flooding, and plumbing issues can lead to mold growth. Our team can find and eradicate this health hazard. Our mission is to make your restoration project go as smooth and as fast as possible. We make the process simple from a complete on-site estimate to on-time completion of the job. Call us anytime, 24/7. After fire, water, and mold damage it is important to get help as quickly as possible. DRYmedic® has 20 years of experience in residential and commercial restoration. We even help you deal with insurance claims! We're here to help. We have the fastest response time in the area year round.